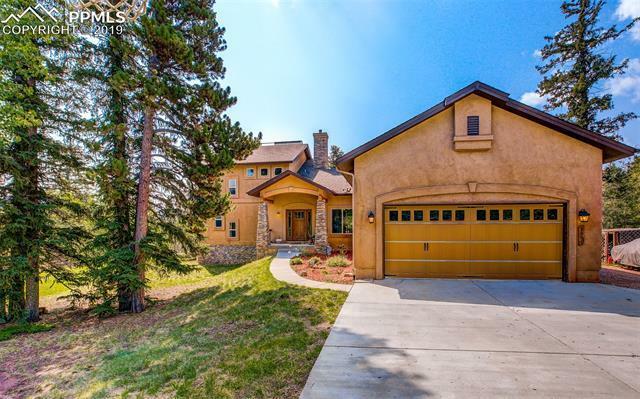 In the county with city amenities, youâll love this outstanding custom built 4 bedrm, 3 bath open floor plan mountain home. On the main level are the living with fireplace, granite and stainless kitchen and dining great room. Also on this level are bedrooms 2&3, granite main bath, laundry and 2 car garage. The back deck is perfect for those relaxing Colorado mountain evenings. Upstairs is the master suite with 5 piece granite bath and spacious walk-in closet. Downstairs is the walkout family rm, bedrm 4 and a granite bath. © 2019 PikesPeak Multiple Listing Service. All rights reserved. Information deemed reliable but is not guaranteed. The data relating to real estate for sale on this web site comes in part from the Broker Reciprocity Program of PikesPeak Multiple Listing Service. Information provided is for consumer's personal, non-commercial use and may not be used for any purpose other than to identify prospective properties consumers may be interested in purchasing. The listing broker has attempted to offer accurate data, but buyers are advised to confirm all items. Information last updated on 2019-04-21.